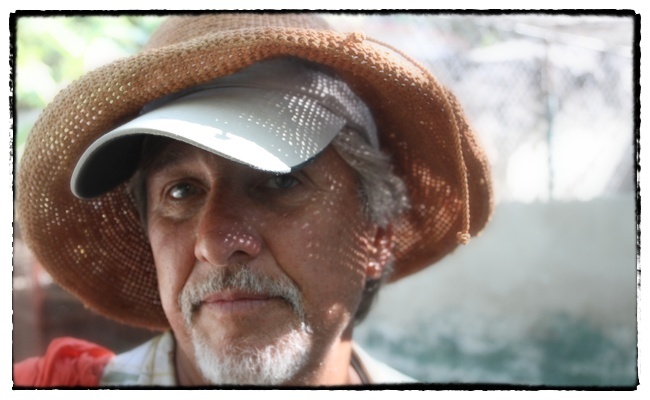 You are currently browsing the archive for the Punta el Custodio category. I hate people who ask me what sort of animal I’d like to be. They’re the sort of people who love Celine Dion and think J. K. Rowling should get the Nobel prize in literature. Frankly, I would never want to be any animal. Their lives are very British: nasty, brutish, and short. One animal I’d particularly never want to be is a sea turtle. Talk about nasty and brutish (and often short). Playa las Tortugas isn’t just a pretty name. There are actually turtles here. 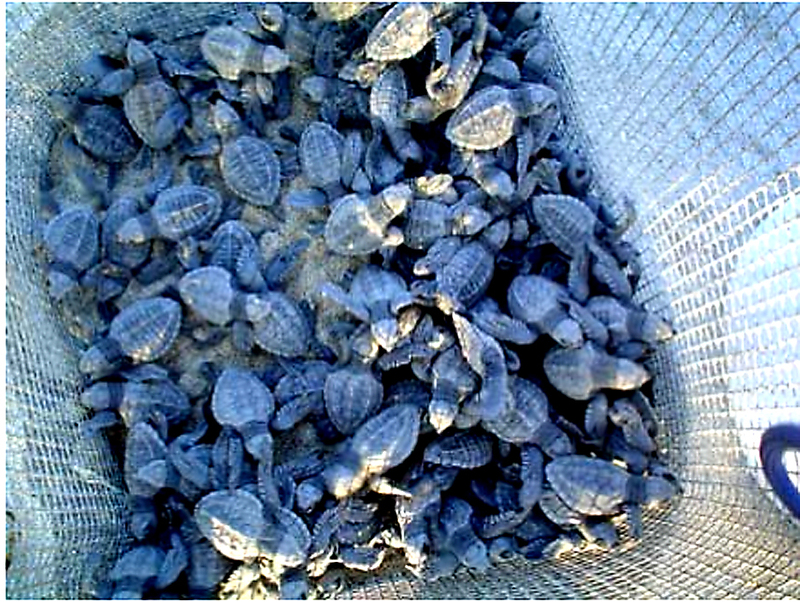 In fact, the five miles of coastline along this stretch of Nayarit Riviera is a Mexican sea turtle conservation area. Between June and December, a couple hundred, at most, female sea turtles—mostly Olive Ridleys, although also Leatherbacks and Blacks—make their way back to Playa las Tortugas and lay thousands of eggs in the sand. During this time, volunteers and students patrol the beach and, when they find a nest, mark it and keep an eye on the eggs until they hatch. Then BOOM! Over a few nights time, thousands of hatchlings, smaller than the palm of your hand, hit the beach like it’s D-Day and they’re invading Normandy—in reverse. I’m not sure exactly how many baby Olive Ridleys were released last month. Just for the sake of argument, let’s say it was something like 10,000 (in 2007, a record number 106 female turtles came up to lay nests on Playa las Tortugas resulting in some 8,000 hatchlings, so let’s be optimistic here and assume there were even more moms around in 2008). So that’s pretty good, right? I mean, 10,000 turtles, small or not, would certainly make a hell of a mess around my house. But—and this is the reason I’d never, ever want to be born a turtle—the survival rate for hatchling turtles is a measly 1%. Which means that even if 10,000 Olive Ridleys made it into the calm waters of Turtle Beach on a moon-less night shortly after Halloween last year, only about a hundred will ever return. Now that’s nasty, brutish, and short. Me cleaning taco sauce off the windshield of the Blue Whale. Photo by David Lansing. I dropped Jeff off at the airport today. As I was driving back to Bucerias, I thought about the last time Jeff was down here and I somehow convinced him to do a roadtrip with me from Puerto Vallarta to Los Angeles. What I remember is that the night before we left, Jeff suddenly came down with an intestinal problem and he wasn’t able to eat the carne asada we’d ordered at a restaurant in Bucerias. Not wanting to waste it, he’d asked the waiter to wrap it up in aluminum foil. The next day, we stop to get gas before heading off into the jungle. While I’m paying for the gas, Jeff gets the foil-wrapped steak tacos from dinner and puts them on the windshield, held down by the wipers. Me: What the hell are you doing? Jeff: Heating up my tacos. It’s a hundred degrees outside. They’ll be warm by the time we get to Mazatlan. Me: The windshield wipers aren’t going to hold them! Those babies will go flying off in two minutes. Jeff: They’ll be fine. Just go slow. So off we went through the jungle. With two big aluminum foil packets of tacos underneath the windshield wipers. At one point the tacos de parabrisas started to creep up the windshield but I found that if I kept my speed around 40-45, they were okay. Although some of the sauce leaked, making salsa rivulets down the hood of the Blue Whale. 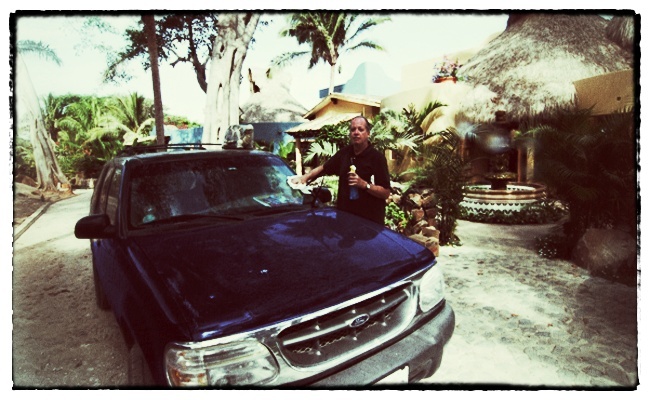 Just before we got to Mazatlan, Jeff hopped out and grabbed the tacos. They were a little soggy but heated through. We had them with a couple of orange Fantas we bought at an Oxxo. The next morning when we gassed up before leaving Mazatlan, Jeff went into the quickie mart and got two $.69 hot dogs. He stuck them under the windshield wipers where they stayed as we crossed the Sonoran desert. I think this may become a regular thing with him. The beach scene at Rincon de Guayabitos. When Rose heard that Jeff and I were going up north to Custodio to visit the Fletchers, she suggested we stop at Guayabitos on the way back. “It’s my favorite beach,” she said. “The bay is so calm.” So Saturday when we were having breakfast with the Fletchers, I asked Malin what she thought about Guayabitos. Guayabitos—or Rincón de Guayabitos, as it’s officially called—is a small town about 70 minutes north of Puerto Vallarta. For decades it was nothing much more than a fishing village. But in the 70s, the Mexican government developed it as a vacation destination, perhaps thinking it would become the next Acapulco. It never developed much of an international draw, but it did become quite popular with thousands of middle-class Mexican families who flock to the area on weekends and during Semana Santa, Mexico’s Spring Break equivalent. We turned off the highway and drove slowly down Avenida del Nuevo Sol, the town’s main drag, passing the usual hodge-podge collection of auto-repair shops, cheap restaurants, and souvenir stands selling inflatable floats, beach umbrellas, and suntan lotion. There were any number of inexpensive hotels lining the strip painted in sherbet colors of tangerine and lime and cherry. Every once in awhile, we’d catch a glimpse of the beach on our right but it wasn’t clear as to how you accessed it or where there was public parking. Eventually we decided to just pull over near a laundromat and go exploring. Traveling, as I have, all over the world in all sorts of circumstances, I’ve learned to trust my gut instincts about a place, and what my instincts were telling me here is that we should not leave anything valuable in the car—and we should not leave the car unattended for more than a few minutes. Which is why I suggested to Jeff, before locking up, that he might want to take his backpack, which contained his wallet and passport, with him. “But we’re just walking down to the beach,” he said. Maybe it was the group of shirtless teens lolling about in front of a taqueria. Or maybe it was the down-at-the-heels man squatting on his heels in front of the laudromat. Something about the place just didn’t feel right. We walked down the avenida until we found a dirt road that veered off towards the beach. It was lined with a sewage canal that gave off fumes of muck and trash and dead animals. At the end of the road was an open-air restaurant right on the beach. Two little boys were playing Pogs on the concrete floor while a teenager sat hunched over a laptop. There were 20 or 30 tables in the restaurant and although it was just after four—comida time for most Mexicans—only an elderly couple, sitting silently in the corner, were dining. We passed through the restaurant and walked out on to the wide, brown sandy beach. The bay was full of Jet-skis and pangas. Hundreds of families sprawled on blankets and towels up and down the beach while vendors hawked hammocks and silver bracelets and shrimp-on-a-stick and plastic cups full of sliced pineapple and watermelon. In short, it didn’t look terribly different from the scene you’d find at Sayulita, just 15 or 20 minutes further south, but it just felt different. And not in a good way. Jeff and I had originally thought about spending the afternoon here, but after taking a short walk up the beach, we decided we’d seen enough and decided to leave. Back at our car, several of the shirtless youths we’d seen hanging around earlier were now huddled around our car. I smiled. “Buenas tardes,” I said. I got no response. Slowly the boys moved back a few feet as I unlocked the car. “You are visiting Guayabitos?” one boy said in English. I nodded. “We’ll do that,” I said. And then he moved away from the car and we drove slowly down the street full of potholes, the boys standing there watching us go. The oh-so-stylish Malin wearing one of her many hats. Photo by David Lansing. Earlier this year, Malin celebrated one of those big birthdays with a big 0 behind it and I volunteered to make a video for the party. Her husband, Chris, gave me literally thousands of photos to sift through for the video. Shots of her growing up as a child in Sweden, coming to California as an exchange student, her courtship and marriage to Chris, then the three babies that followed. When I’m putting videos like this together, I’m always looking for some sort of theme running through the photos, something I can hang a story on. With Malin, it was hats. Over the years, there were shots of her wearing Swedish naval hats and Viking horns; fur hats, felt berets, and wool caps; big, floppy JackiO straw numbers and peculiar British hats with feathers and such. I thought what I’d do is interview Sally, her wonderful, stylish mother-in-law, and rather tongue-in-cheek, have Sally point out that as a mom-wife-volunteer-teacher-Swedish advocate, Malin obviously wore a lot of hats in the family. 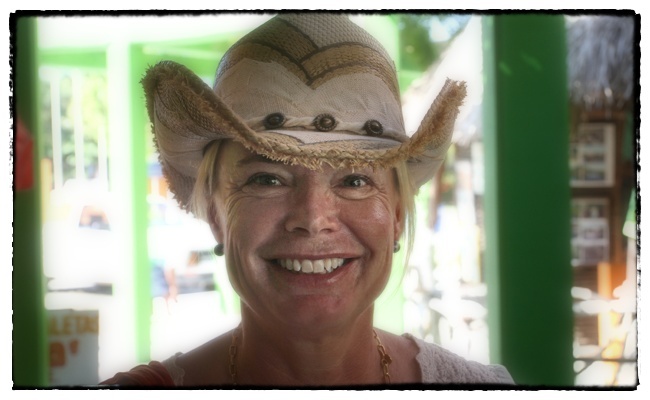 And intersperse Sally’s interview with dozens of quick shots of Malin over the years wearing various hats. But the video got to be a bit long as I was putting it together and I had to scrap the hat idea. What I didn’t stop to consider when I was thinking of Malin and hats is that her husband, Chris, also has a fondness for odd hats. As you can see from this photo I took of him last year when we went birding in San Blas. If you look closely, you’ll see that he’s actually wearing two hats: a baseball hat and then a floppy straw number. It’s rather striking, don’t you think? Perhaps some fashion designer will see this photo and all the male models will be wearing double hats during fashion week next spring. Chris just might start a new trend in the fashion world with this double hat look. Photo by David Lansing. Chris cleaning the sierras that Marta will turn into ceviche. Photo by David Lansing. In the morning, we went fishing. The weather was fine—clear, no wind, and no surf. Diego was down at the beach waiting for us. We put all our gear in his panga and helped him push off into the surf, jumping into the boat once the water got up to our knees. It is not easy for three men to fish in a panga. What you have to do is let one line out directly behind the engine and then let the other lines out on either side of the boat and hope the lines don’t get fouled. They will, inevitably, get fouled but you hope it doesn’t happen too many times. We had not been fishing for more than fifteen minutes before we caught a good-sized fish they call a toro. It looks like a tuna but is smaller and not very good tasting unless you smoke it. Each of us caught several fish in the first two hours and then we trolled for a bit out over the reef enjoying the clear, calm water and watching the dolphins jump but not catching any more fish. Finally, Chris turned to me and asked if I was ready to go back. I said we should give it another fifteen minutes and suggested a bet: If one of us caught a fish in the next fifteen minutes, the other would have to swim back to shore. So we fished and not five minutes later, Chris hooked into a good-sized fish that we thought might be a jack crevalle. When one person hooks a fish the boat etiquette is that the others reel their lines in so the fish won’t get fouled while coming to the boat. So Pete and I started quickly reeling in our lines. “Lansing, you’re going swimming!” Chris said as he fought the fish. His pole was bent almost in half and the fish was large enough that it was still taking line out. I had almost gotten my line all the way in when my pole suddenly bent in half. I had a strike as well. Because my line was so close to the boat it took me only a few minutes to reel my fish in. 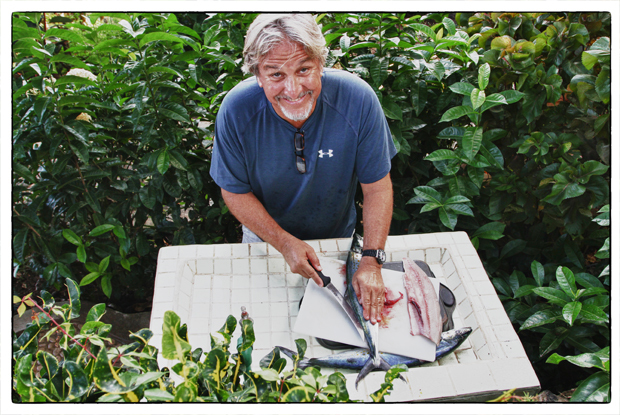 It was a fine looking sierra, an excellent fish for ceviche. We already had a few sierra in the boat but this was the biggest yet. Meanwhile, Chris was still trying to bring his fish in. When he finally got it to the boat, it was a very large toro. So, I said, are you ready to swim to shore? What do you mean? he said. I hooked up before you did. Yes, but I got my fish into the boat first. That means you’re the one who has to swim to shore. And he would have done it, too. We were at least a mile off-shore and it would have been a very difficult swim and there are sharks in this area (in fact, Diego told us that he had caught a large shark night fishing last night) but we agreed that the bet had been a tie—he caught his fish first but I got mine in to the boat before his—and so neither one of us had to swim to shore. Which was probably just as well. I’m not sure either one of us would have made it.